Another year, another incredible array of nonfiction picture books for your youngest readers! The nonfiction picture books for kids released in 2018 were simply unbelievable. The stories were engaging, the facts intriguing, and the illustrations truly remarkable. To say I’m in awe of the books I’ve added to my boys’ collection as well as our school library is an understatement. I’m truly astounded by the depth and breadth of these stories and the painstaking research that goes into each one. Each of these books is a remarkable achievement by the authors, illustrators, agents and editors that put them together, and I am continually grateful to these stellar teams for getting these stories into the hands of young readers. And now, without further ado, these are the nonfiction picture books from 2018 that my children, my students and I most adored, the ones we read over and over again, and the ones that contained facts and illustrations that surprised, delighted and even tricked us as we read! A History of Pictures for Children: From Cave Paintings to Computer Drawings, by David Hockney and Martin Gayford and illustrated by Rose Blake: If you have kids that love creating and can’t get enough or art and painting, this awesome book takes young readers on a journey through art history. Discussing everything from cave paintings to iPhone photography, you don’t want to miss this one for your budding artists! The Atlas Obscura Explorer’s Guide for the World’s Most Adventurous Kid, by Dylan Thuras and illustrated by Joy Ang: Have a kid who dreams of exploring the world as soon as he can? Have a child who thrives on adventure? This fabulous book describes one hundred of the coolest, weirdest places on our wondrous planet. It is your passport to some of the most incredible, breathtaking and unbelievable attractions around the globe, and if you have a child with wanderlust, he won’t be able to put this one down. Lovely Beasts, by Kate Gardner and illustrated by Heidi Smith: This fabulous book encourages young readers to challenge what they think they know about some of the worlds “scariest” animals. Gorillas, porcupines and rhinoceroses may certainly be frightening, but they do exhibit some surprising - even gentle - characteristics. I absolutely love the way this book challenges preconceived notions children (and adults!) have about wild animals and the manner in which it inspires them to move beyond first impressions. Earthrise: Apollo 8 and the Photo that Changed the World, by James Gladstone and illustrated by Christy Lundy: Many of us learned about the Apollo 8 mission to explore space. But did you know about the photograph astronauts took from the spaceship that sparked hope worldwide and electrified the environmental movement? This book elegantly weaves facts into an accessible, mesmerizing narrative, and I fell in love with its simplicity, beauty and profound message. The Elephant, by Jenni Desmond: Did you know elephants walk on their tip toes? Or that they can detect the rumbling of other elephants from nearly six miles away? We absolutely adore Jenni Desmond’s non-fiction offerings, including The Blue Whale and The Polar Bear, and this beautiful picture book about the endangered elephant is another stunner filled with gorgeous, true-to-life illustrations and fascinating facts for little minds. Dinosaurium: Welcome to the Museum, by Lily Murray and illustrated by Chris Wormell: Calling all dinosaur lovers! Raise your hand if your kids are obsessed with learning about these gigantic, ancient beasts. If your hand’s up, you need this fabulous guide in your home! Welcome to the Museum is a beautiful, informative series, and this installment features a wide range of dinosaurs for kids (and adults!) to learn about, from the triceratops to the much less known tsintosaurus. Your children will be mesmerized! And make sure to check out the other books in this awesome series, Botanicum and Animalium. Drawn from Nature, by Helen Ahpornsiri: Oh my gosh is this book exquisite! You won’t want to miss this one if you teach your kids or students about our four seasons. The illustrations are intricately made from pressed plants and include leaves, seeds and petal. The result? A uniquely gorgeous feast for the eyes, capturing our world’s natural wonders in a majestic way. National Parks of the U.S.A., by Kate Siber and illustrated by Chris Turnham. If you love the great outdoors, this is a book your kids need on their shelves! This book has already been awarded a 2019 Outstanding Science Trade Book for Students: K-12, and it’s no secret why. 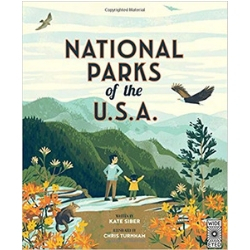 Through captivating illustrations and text, this guide through our national parks, divided into six regions, introduces students to the various flora and fauna of 21 different parks, complete with a summary of each park’s makeup as well as illustrations of the animals and plants that live in each. Flying Machines, by Ian Graham and illustrated by Stephen Bietsy: Have a child that can’t get enough of airplanes? This fabulous interactive book describes eight of the most incredible flying machines of all times, while also introducing famous aviators and the first aircrafts. Flaps and fascinating details about planes and helicopters make this a fabulous introduction for children! Professor Astro Cat’s Human Body Odyssey, by Dominic Walliman and illustrated by Ben Newman: If your kids are totally intrigued by the human body — its inner workings, why we actually have certain body parts, and why we do the things we do — your little ones will love this book! Professor Astro Cat and his gang are back in this adventure through the human body, traveling from head to toe to teach kids everything they want to know! Two Truths and a Lie: Histories and Mysteries, by Ammi-Joan Paquette and illustrated by Laurie Ann Thompson: My students can’t get enough of these crazy stories - they just can’t believe they are true! This awesome book is a play on everyone’s favorite party game — it tells two true stories and one fake one, and you have to guess which ones are real and which is false. Kids are always astounded when the most unbelievable stories turn out to be factual. It is wild, informative, and a totally engaging read, especially for those kids who are more reluctant to pick up non-fiction. Highest Mountain, Smallest Star: A Visual Compendium of Wonders, by Kate Baker and illustrated by Page Tsou: Do you have a child wondering about the height of the tallest mountain on earth? Whether a bird can fly faster than an airplane? This gorgeously illustrated book is chock-full of comparisons and absolutely perfect for those of you with curious kids who can’t stop asking questions. From nature to dinosaurs, the solar system to trees, you don’t want to miss this if you have an inquisitive kid! The Eye that Never Sleeps: How Detective Pinkerton Saved President Lincoln, by Marissa Moss and illustrated by Jeremy Holmes: Allan Pinkerton will forever be known as one of the greatest American detectives. Though he has a resume full of accolades, his most important and well known achievement was protecting Abraham Lincoln on the way to his presidential inauguration in 1861. Though a group of assassins was attempting to murder Lincoln while on the way, Pinkerton foiled the plot and ensured the president made it to the capital safe and sound. A fascinating and little known slice of American history! First Generation: 36 Trailblazing Immigrants and Refugees Who Make America Great, by Sandra Neil Wallace and Rich Wallace: This fabulous anthology chronicles the lives of immigrants and refugees who have made phenomenal contributions to American society. These courageous men and women hail from countries world wide, such as Mexico, Syria, China and Somalia, and include iconic figures like Secretary of State Madeline Albright, Albert Einstein and journalist Jorge Ramos. It is at once inspirational and motivational, and children will be astounded by the obstacles overcome and the determination each of these figures possessed. Herstory: 50 Women and Girls Who Shook Up the World, by Katherine Halligan and illustrated by Sarah Walsh. What a collection! This is a fabulous keepsake, a beautiful compilation celebrating the remarkable accomplishments of fifty women who changed the world and left an indelible mark on our society. Readers young and old will learn about the challenges these women faced as children and young adults and be forever inspired by their courage and stunning achievements. How to Build a Hug: Temple Grandin and her Amazing Squeeze Machine, by Amy Guglielmo and illustrated by Giselle Porter: There’s nothing quite as inspiring as reading a story about a person who has overcome so many odds to achieve wild success. And Temple Grandin is at the top of that list - conquering such an array of obstacles that her achievements are simply mind-blowing. As a child with autism, Grandin hated hugs — but she so desperately wanted one. It wasn’t until she invented her amazing Hug Machine that she was able to realize her dream - and this was just one of numerous accomplishments. Astounding! Just Being Jackie, by Margaret Cardillo and illustrated by Julia Denos: Jackie Kennedy was not just JFK’s beautiful wife and an icon of style and grace. She was so much more than that! Jackie was smart, tireless in her work as first lady, a gifted journalist, a critical part of the preservationist movement to secure the legacies of national landmarks, and an award-winning editor. Her name alone evokes respect, brilliance and sophistication, and this book so beautifully highlights her life and achievements. 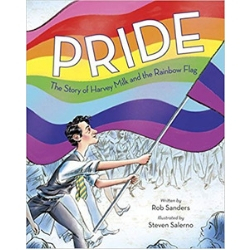 Pride: The Story of Harvey Milk and the Rainbow Flag, by Rob Sanders and illustrated by Steven Salerno: Harvey Milk had a dream to create a global symbol of unity and inclusion, one that would allow LGBQT people to be proud of not just who they are, but also who they love. This beautiful book tells the story of the Gay Pride Flag from its inception in 1978 thanks to Milk’s activism, all the way to the present day, describing how it became an important symbol worldwide. This is a story of love, hope, and equality that has an important place on every book shelf! Little Dreamers: Visionary Women Around the World, by Vashti Harrison: In the highly anticipated follow up to her knock out book, Little Leaders: Bold Women in Black History, readers are introduced to the true stories of 35 influential women in their respective fields, some whose names will be recognized, and some you may not know. From trailblazing artists like Mary Blair to environmental activist Wangari Maathai, this book will leave you inspired to get out there and do something incredible. 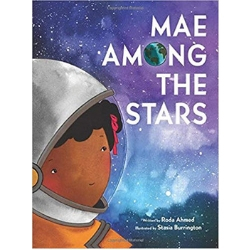 Mae Among the Stars, by Roda Ahmed and illustrated by Stasia Burrington: This beauty of a book tells the story of Mae Jemison, the first African-American woman to travel to space! With her mother’s words of encouragement continually whispered in her ears, Mae’s intelligence and drive led her to conquer insurmountable odds until she found herself at NASA. “If you believe it, and work hard for it, anything is possible.” You can even touch the stars. Turning Pages: My Life Story, by Sonia Sotomayor and illustrated by Lulu Delacre: Sonia Sotomayor is the first Latina Supreme Court justice, inspiring children across the United States - and even world wide - to chase their dreams. But did you know that it was books and reading that inspired Justice Sotomayor? It was books that helped the Justice navigate her world, everything from her father’s death to her diabetes diagnosis to helping her connect with family in New York and Puerto Rico. If you simply turn the page, you are opening yourself up to a world where anything and everything is possible. Which of these books are got two trunks up from your kids or students? What would you add to our list? Make sure to let us know on our Facebook page! Did you like this post? We have a good feeling you will love these too! Favorite Picture Books of 2018, Favorite Middle Grade Books of 2018, and Top 20 Picture Books of 2017. Make sure to check them out!